The Joshua White Quintet performed at Dizzy's on Feb. 20. San Diego pianist Joshua White has recently embarked on a concert commitment at the Pacific Beach venue known as Dizzy’s to celebrate his 10th year as a bandleader. 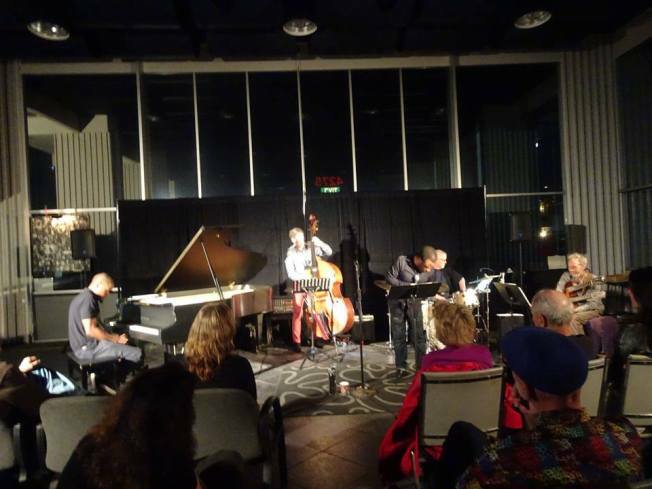 Each month he presents a different ensemble and loads of new music, and on Feb. 20, he arrived with guitarist Peter Sprague, bassist Rob Thorsen, vocalist Leonard Patton and drummer Duncan Moore for a night of musical exploration that delighted the packed house assembled. Opening with the complex, swinging matrix of a tune he calls “030,” White revealed multiple layers of ideas that swirled and blended in the air with heavy contributions from Sprague and Patton. White’s powerful solo recalled McCoy Tyner, and his hands seemed to generate motion from every direction at once. There was a more ruminative vibe happening with “Morning,” which had a sound similar to material from Herbie Hancock’s epochal “Maiden Voyage,” with Patton’s soulful, yearning tenor and effusive scatting contrasting nicely with the leader’s nervous energy, which sparked with enough strength to make zombies dance. Waves of spontaneous applause rippled through the crowd. Thorsen’s basso profondo opened “A Million Daze” in a deep a cappella, opening the door for Sprague, whose intricate essay brimmed with precise articulations and effortless flow with Patton’s vocals, reminding me a lot of Pat Metheny’s work with the Argentine singer Pedro Aznar. Moore’s shimmering cymbals provided an appropriately gauzy backdrop for one of White’s most enduring themes, “Curiosity Landing,” which traversed from a very free piano etude into a startling novella from Sprague, who made the piece his own by pushing the boundaries between the sacred and the profane in an episodic solo. Independent voices casted about in the wind on “Softly, as in a Morning Sunrise,” where White’s interruptive clusters wrangled for dominance against Patton’s oblique and elastic phrasing before yielding to a sparking contribution from Sprague, which seemed to fuse the two approaches. Sprague also illuminated White’s “Scarlet Tanager,” which began with soft reverberant clouds of harmony before turning sharply into an exploratory solo that flirted toward the outer limits. White’s evolution as a musician has been a marvel, and his growth as a composer and bandleader are two of the best reasons to venture out on any given San Diego night. Let’s all enjoy this while we can.